The numbers of foreign students studying in China are also increasing by 10% in a year to more than 290,000 in 2011, according to the Chinese Ministry of Education about 320,000 overseas students came to China in 2012, the majority from South Korea and the United States. China's education system will be promoted in Europe now says the Chinese Ministry of Education. China’s vice-minister of education said that by 2020, about 500,000 international students will be in China, enabling the country to become the largest Asian destination for international students. The push for foreign students is a thoughtful strategy by the Chinese government through investment in scholarships and facilities to substitute a greater understanding of their culture and language globally, and expand Beijing's "soft power," academics. The British Council, in UK which is leading the campaign, said around 3,500 students from UK travelled to China in 2011 but it wanted the number to grow to at 15,000 by 2016. 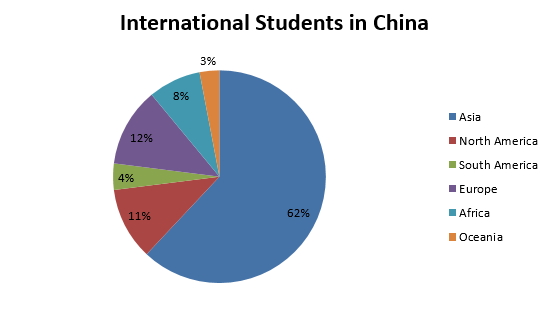 Students from all over the world have started coming China to study, as you can see in the above chart the highest number of students come from Asia and Europe. Soon Europeans student’s top preference is going to be China due to the amount of money China wants to invest in education. In fact, since it’s a huge country and now they are focusing on attracting and giving benefits to International students education, students from all over the world will want to avail this opportunity.